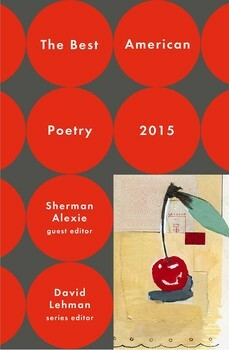 The premier anthology of contemporary American poetry continues with an exceptional volume edited by award-winning novelist and poet Sherman Alexie. Since its debut in 1988, The Best American Poetry has become a mainstay for the direction and spirit of American poetry. Each volume in the series presents the year’s most extraordinary new poems and writers. Guest editor Sherman Alexie’s picks for The Best American Poetry 2015 highlight the depth and breadth of the American experience. Culled from electronic and print journals, the poems showcase some of our leading luminaries—Amy Gerstler, Terrance Hayes, Ron Padgett, Jane Hirschfield—and introduce a number of outstanding younger poets taking their place in the limelight. A leading figure since his breakout poetry collection The Business of Fancydancing in 1992, Sherman Alexie won the National Book Award for his novel The Absolutely True Diary of a Part-Time Indian. He has written short stories, novels, screenplays, and essays, but he is at his core a poet. As always, series editor David Lehman’s foreword assessing the state of the art kicks off the book, followed by an introductory essay in which Alexie discusses his selections. The Best American Poetry 2015 is a guide to who’s who and what’s happening in American poetry today. Since its debut in 1988, The Best American Poetry has become a mainstay for the direction and spirit of American poetry. Each volume in the series presents the year’s most extraordinary new poems and writers. Guest editor Sherman Alexie’s picks for The Best American Poetry 2015 highlight the depth and breadth of the American experience. Culled from electronic and print journals, the poems showcase some of our leading luminaries—Amy Gerstler, Terrance Hayes, Ron Padgett, Kay Ryan—and introduce a number of outstanding younger poets taking their place in the limelight. A leading figure since his breakout poetry collection The Business of Fancydancing in 1992, Sherman Alexie won the National Book Award for his novel The Absolutely True Diary of a Part-Time Indian. He describes himself as “lucky enough to be a full-time writer” and has written short stories, novels, screenplays, and essays—but he is at his core a poet. As always, series editor David Lehman’s foreword assessing the state of the art kicks off the book, followed by an introductory essay in which Alexie discusses his selections. The Best American Poetry 2015 is a guide to who’s who and what’s happening in American poetry today.